When it comes to making popular online video slots based on the fun of the big top, online slot developer Microgaming certainly have some form. A $25,000 jackpot is the ‘big’ attraction of their circus-themed slot, Big Top (although a bonus round or two wouldn’t have gone amiss). Then there is also the colorful Carnival Royale slot utilizes the developer’s trademark 243-ways-to-win betting system as you hit up two generous bonus features. 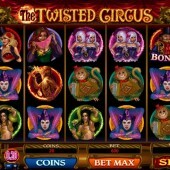 Microgaming’s The Twisted Circus slot takes a similar theme and turns it on its head by venturing into somewhat darker territory. 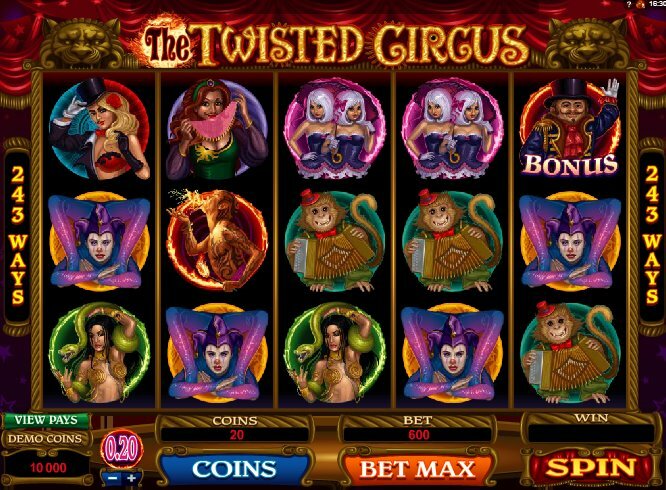 This 5 reel slot employs the developer’s 243-ways to win system, like Carnival Royale, but takes a more Jim Rose’s Sideshow tack on things with a bearded lady, a tattooed strong man, snake charmers and a dwarf ringmaster for company. The game’s logo acts as the Wild and substitutes for all regular symbols in the game other than the Scatter Ticket and the Bonus Ringmaster symbols. Wins are trebled with the Wilds and five Wilds across the reels awards a 15,000-coin jackpot. Roll up, roll up for the Circus Match Bonus feature when you hit three Ringmaster icons on reels 3, 4 and 5. You’ll be taken to a 4x4 grid where you’ll have to pick icons until you match three characters. Look out too for the flaming Wilds which can substitute for all symbols on the screen. The Wilds really make this bonus feature come alive, and a potential 42,000-coin jackpot can be yours if you match well. And when you hit a three-symbol match, you’ll be awarded with a nice little animated routine by one of the performers. Earn at Least 13 Free Spins! Free spins fiends are well served by the game’s other bonus feature. Three or more Ticket symbols will triggers 13 freebies, with each winning combo receiving a 3x multiplier. Free spins are re-triggerable and this is where the big jackpots come in – 555,000 coins can be won, so when playing at $0.20 a coin, that makes....oh, you do the math. This is a lovely slot for fans of the circus, and the dark theme makes things all the more interesting. If one of the other circus-themed online slots we mentioned at the top of the review doesn’t quite float your boat, try out the horror-themed Halloweenies slot, also from Microgaming.